Mole (Spanish for "sauce" or "concoction") is the generic name for several sauces used in Mexican cuisine, as well as for dishes based on these sauces. 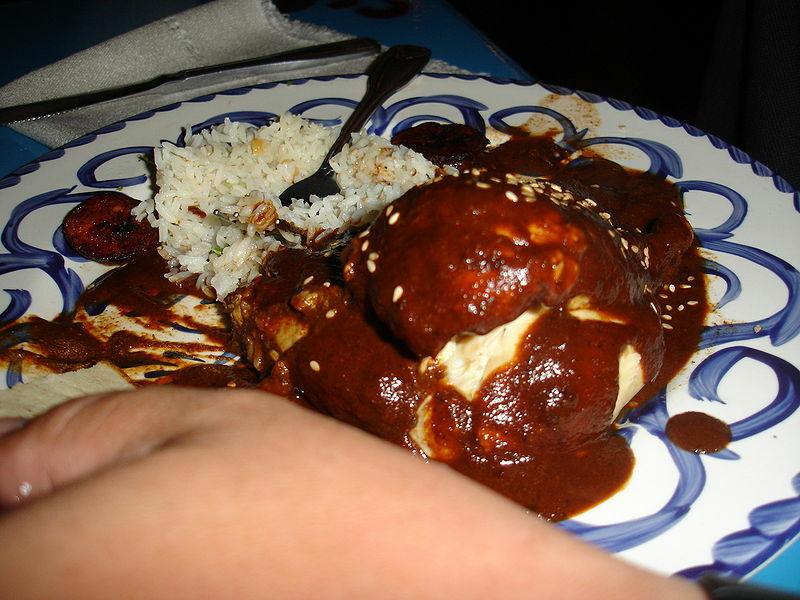 Outside of Mexico, it often refers to a specific sauce which is known in Spanish by the more specific name mole poblano. The word is also widely known in the combined form guacamole (avocado concoction). Mole can be best defined as a very thick, homogeneous sauce with complex flavors. This distinguishes it from most Mexican salsas which have a thinner consistency, often raw, and contain fewer ingredients (usually nothing more than tomato, onion, garlic and chili pepper) in still-identifiable chunks. The most popular kind of mole is mole poblano, whose name comes from the Mexican state of Puebla. Mole poblano is prepared with dried chili peppers (commonly ancho, pasilla, mulato and chipotle), ground nuts and/or seeds (almonds, indigenous peanuts, and/or sesame seeds), spices, Mexican chocolate (cacao ground with sugar and cinnamon and occasionally nuts), salt, and a variety of other ingredients including charred avocado leaves, onions, and garlic. Dried seasonings such as ground oregano are also used. In order to provide a rich thickness to the sauce, bread crumbs or crackers are added to the mix. The most common way to consume mole is over chicken, though any kind of meat may be served with mole sauce. Another preparation, more common in restaurants, is enchiladas (corn tortillas wrapped around chicken, cheese or some other simple filling) baked in mole sauce. Because of the labor-intensive nature of mole, when prepared at home it is most often made in large batches on special occasions, such as religious holidays, birthdays or weddings.